The Chairman is a retro sci-fi/horror short about the intersection of business, media, and the supernatural. 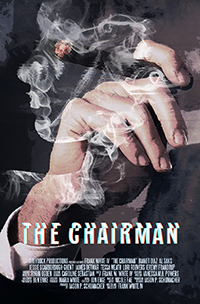 The Chairman draws inspiration from a wide variety of 20th century genre material. From the cynical media accelerationism of Paul Verhoeven to Nigel Kneal's scientifically recontextualized spiritualism, with hearty helpings of Cronenberg, Ballard, and even Kiyoshi Kurosawa. Beyond asthetics and nostalgia, it seeks to emulate retro horror at its most intellectual, a tradition from long before the phrase "elevated horror" emerged from the thinkpiece abyss. 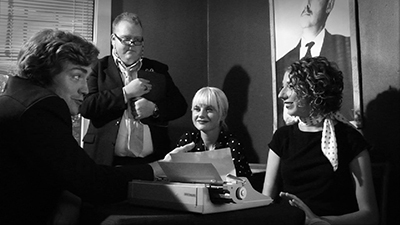 Clocking in at twenty minutes (an epic length in the world of short films) The Chairman is densely packed with contributions from a wildly talented cast and crew. 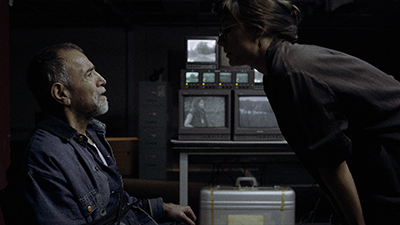 For the world premiere at Cinepocalypse 2018, the best short film actress and actor awards were bestowed on Bianet Diaz and Al Saks for their roles as Katie and her father. 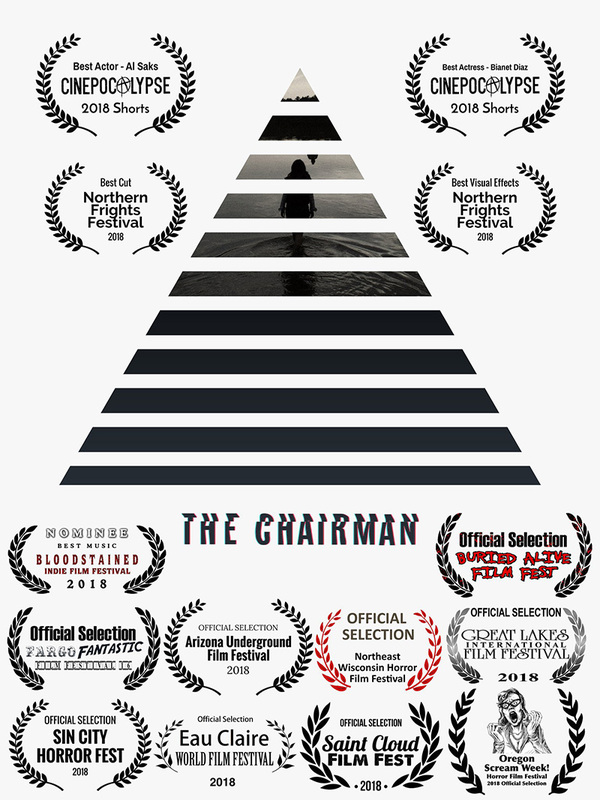 In the second half of 2018 The Chairman played an additional eleven festivals, received four more award nominations, and won best editing and best visual effects at Northern Frights. The editing award is especially exciting for yours truly, as it's the first win for something I'm directly responsible for, so not only can I call it an award winning film, but I be insufferably smug and can call myself an award winning filmmaker. 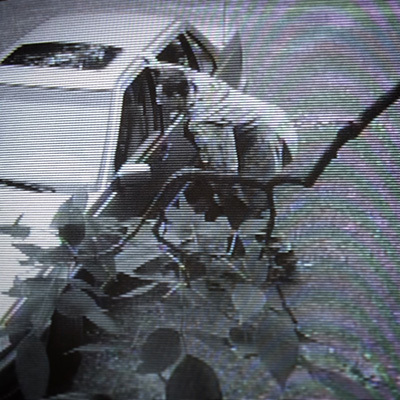 While the film's eventual release on VOD/VHS is waiting for its festival run to wrap up, you can check out its trailer below, and enjoy the short's ghostly, analog synth score by UK composer OGRE Sound. Ladies and gentlemen, Video Updates is officially in the content™ business. Please refrain from burning yourself out on retro trash before you see our short around Halloween 2018. In the history of film criticism, gallons of ink have been spilled over auteur theory, but without the funds, clout, and sheer force of dickish will that enables James Cameron to perfectly translate the little picture shows in his skull into 48fps 3D multiplex fodder, low budget filmmakers must endlessly sacrifice chunks of their vision on the altar of practicality. (Unless those visions conveniently spring forth from a Mumblecore id.) The various actors and crew-members involved in a production all leave fingerprints on the piece, too, leaving many a would be auteur wondering if how much of the final product truly belongs to them. The fictional playwright and director from Minnesota indie The Telephone Game spends much of the movie losing control over the creative concepts crystalized in his head as they spill forth into a production, while the film itself muddies the question of its own authorship via a script improvised by the actors. 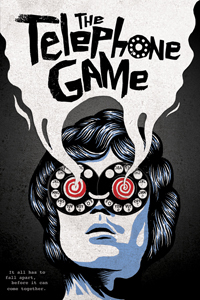 Directed by Jason Schumacher, The Telephone Game has an organic, mockumentary feel, despite at no time being billed as such. In a traditional movie, scenes are assembled from the best versions of their constituent parts based on an overarching structure, while their improvised doppelgangers are instead grown in long takes. Fruitful exchanges and choice lines of dialog are seeded into subsequent attempts until either the director is satisfied with the result, or the harsh realities of low budget scheduling come crashing down. The resulting footage is then woven together in much the same way as a non-fiction work. Narrative, theme, character; all the elements that a traditional film would establish in the writing and production phases are instead teased out of the raw dailies. In fact, the main difference between 'documentary style' post production and the real thing is that the editor of fiction is never hamstrung by the ethical concerns that arise when truth and style fail to sync up. 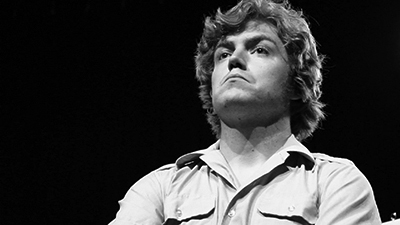 Milwaukee experimental filmmaker and rapper Wes Tank stars as Marco DeGarr, the pretentious writer and director of "The Invisible Ropes," an impenetrable slice of community theater about monkeys and diamonds against a dystopian fantasy backdrop. 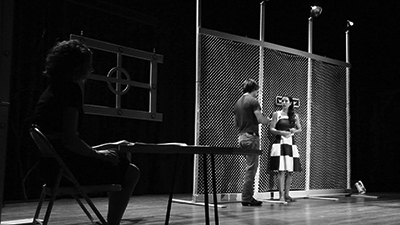 (The play was actually written, in a possible nod to the Ouroboros of life imitating art, by the actor.) 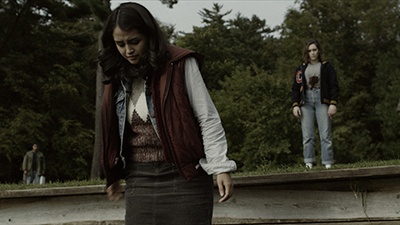 His main foils are theater owner and voice of practicality Irene Ilsely (KariAnn Craig) and leading lady Zelphia Anzhelina (Haley Chamberlain), with whom Marco makes an immediate connection. This connection forms the closest thing The Telephone Game has to a traditional plot, though it refuses to ever slide into melodrama. Following "The Invisible Ropes" from casting to performance provides most the film's structure, but still doesn't quite qualify as the plot. The (movie's) audience is too removed from the chain linked fences, elaborate headdresses, dancing monkeys, and Jupiterian ice cream of the metafictional text to have much investment in its successful production. 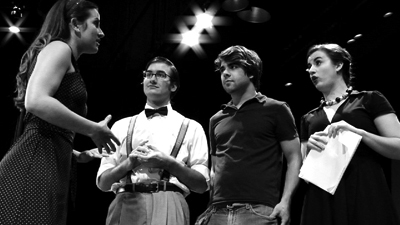 (Even the world surrounding the theater is vague; the telephones are all rotary and bow ties are worn without irony.) Conflict is instead distilled from Marco's less than stable antics. He is already prone to bizarre non-sequiturs when explaining his vision at the movie's start, and his cast's incessant clamoring for direction weighs only grinds him down further. Lacking skills in performing distracting jigs like the tormented director in Fellini's 8½ (one of many influences from classic European cinema on The Telephone Game) and distracted by a blossoming relationship with his leading lady, Marco's interior condition quickly deteriorates. In an unexpected turn, he goes completely fugue state (complete with some Fear and Loathing-esque camera wackiness) before the end of the first act. 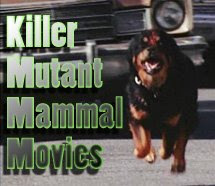 Once the delusions of killer bees subside, he returns to a production that is nigh ready to move on without him and therefore hostile to the new pages of script with which he wants to reclaim his decaying personal vision. 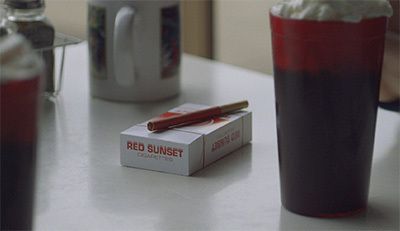 An improvised script inevitably constrains the director's control over his narrative, even though he is on set directing the chaos toward specific goals. (As well as calling the shots in the editing bay.) And while an improv based set would obviously create some cinematographic challenges, the director can still put a much more personal stamp on the visuals. The Telephone Game might be a microbudget indie struggling for attention in a veritable sea of contemporaries, (one of the major drawbacks to video's democratization of feature narrative making: a low signal-to-noise ratio that makes it nigh impossible for anyone to get audiences' attention) but it's already got a Best Cinematography award from the Minneapolis Underground Film Fest (aka MUFF--I know, right?) for its quality emulation of monochromatic celluloid on HD video. The high contrast black & white imagery further muddies the narrative's temporal waters, while giving cinematographer Kipp Zavada plenty of leeway for creating a filmic look. Plus, many of the cheesy looking post production effects that modern editing software provides can be revelatory (or at least not as cheesy) when applied to greyscale footage. When leading lady Zelphia performs a heartfelt song about stardust for Marco and the cast midway through the movie, the darkness behind her fills with particle effects that would likely be laughable in color, but instead suggest 2001's 'Jupiter and Beyond the Infinite' sequence reimagined by Guy Maddin. Making any movie, especially an indie on a minimal budget, can often be like sacrificing your children. ("Murder your darlings," they say.) Explosions, make up effects, dance numbers, and even whole characters must be aborted to keep finances in the black, until the auteur's grand designs are so diluted that he might as well give 'unfortunate circumstances' a writing credit. The Telephone Game may not have had outsized ambitions from inception, but like a cancer ridden Lex Luthor, it knows how to turn its weaknesses into strengths. Note: Before you panic about Cronenberg's Dead Ringers (one of my all time favorites) being in there, the scene is Jeremy Irons running lines with his actor girlfriend. Meta bad writing. If you're looking for tunes to spin for the apocalypse (any minute now, right?) look no further. I've had this ready for years.